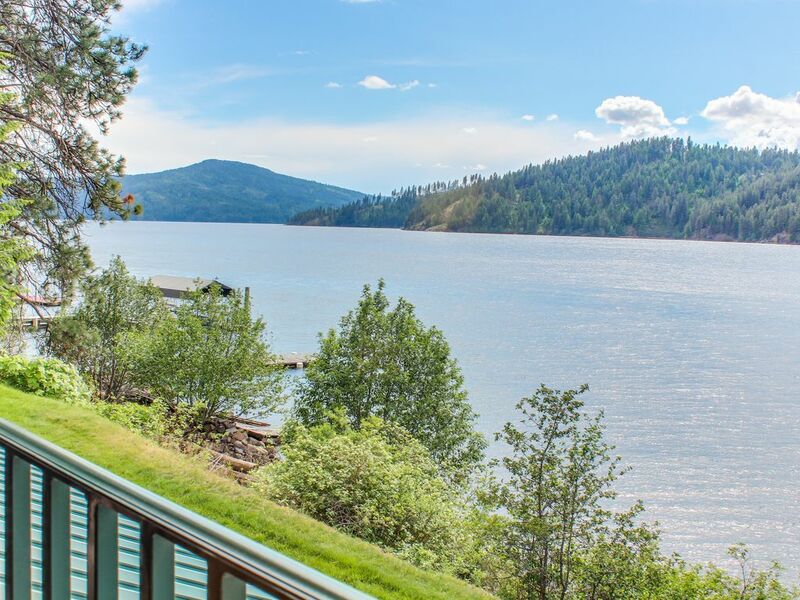 This lakefront Arrow Point condo is the perfect hideaway for a summer holiday, with breathtaking views of Lake Coeur d’Alene and resort attractions! This getaway is located in a luxury community offering a shared beach and pavilions, sports courts, and an indoor pool! Launch your boat only eight miles away or visit nearby Coeur d’Alene, just 18 miles from your door. The open space offers a cozy living room, fully stocked kitchen, and a balcony. Beat cabin fever with cable TV, a DVD player, a stereo, and WiFi (Internet access available for a small fee to the resort)! Dine indoors on the breakfast bar or dining table with seating for the whole family, or enjoy the fresh air! The balcony offers panoramic views of the lake, a bistro table, and gas grill. This Harrison getaway lodges six guests in its three bedrooms and two full baths. Sleeping options include a king bed, queen bed, or double bed. Extra home features like a washer/dryer and central AC will make you feel right at home! Outside, the cool alpine water is calling! Travel with you boat or rent one from Harrison Water Adventures. Lake Coeur d’Alene is a mecca for anglers, sunbathers, and boaters! Bike or hike the nearby Trail of the Coeur d'Alenes or catch a shuttle boat for tee time at the Coeur d'Alene Resort. The city is brimming with restaurants, nightlife and shopping! Silverwood Theme Park is about 35 miles away, offering amazing roller coasters, and Silver Mountain Resort is just a 38-mile drive for alpine skiing. This cheery Lake Coeur d'Alene condo is the perfect place to spend lazy summer days. Book your dream vacation today! Parking Notes: Parking is underground (one spot assigned per unit) or past the building at the public parking lot on the left (unassigned parking) The Worldmark signed spots are ok to use, the Gozzer signed spots belong to our neighboring private club, Gozzer Ranch. You can also park at the top office as you enter the condo facility, there is a golf-cart shuttle ride available during business hours from this parking lot, just ask the front desk or call them at 208-667-2064, there are very helpful and knowledgeable with all aspects of the facility as well. * Boat parking is available from Discovery Marina for $35 per day on "C" Dock. See the Marina Mgr next to the pool house. Thanks for considering a Vacasa home! We provide full-service management for privately owned vacation homes, and like to think that we offer our guests the best of both worlds: the unique experience of staying in a one-of-a-kind vacation home, with the peace of mind that comes from knowing that the home you book for your special vacation is cared for by professional housekeepers and property managers. <br> <br> Vacasa began in 2009, simply because our founder and CEO Eric wanted to find a better way to share his wife’s family’s summer home in Long Beach, Washington with guests as a vacation rental. Eric and his early team worked to build Vacasa on the premise that local employees can do what they love most (taking care of guests, homeowners, and properties), while the hands-off tasks of vacation rental management—things like marketing, filing taxes, and maintaining a website—could be handled by a specialized central support team. <br> <br> Our passion is connecting travelers with the unique experience of staying in a vacation home, and we would be honored to be your host. Please contact us with any questions about this home���our team is standing by! Place was very spacious and comfortable. Some minor issues with Deck door knob and Kitchen pans and knives. This was a very relaxing place despite the smoke from the Forest Fires. We will inspect the door knob and appreciate having it brought to our attention. It was a beautiful place to stay with a beautiful view of the lake. The location was perfect. We were able to visit with friends and family on the balcony with the beautiful view of Lake Coeur d’Alene watching all the sights of the boats going by including seeing the tour boats turning around near us. We were situated between Coeur d’Alene and Harrison near where I grew up earlier and I was able to reunite with a couple of friends I hadn’t seen in over 60 years. And even seeing the old one room schoolhouse still standing. We are hoping to be able to get to do this again next year. Our only complaint was we rented this place for five people and there were only three washcloths which could have been an over sight on the part of the cleaning people. But we loved it here and are we are hoping to do this again next year.